My town of Hampton, VA is on the coast and just across the Chesapeake Bay is Norfolk, home of the Atlantic Fleet. 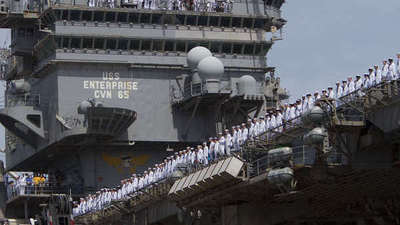 The USS Enterprise carrier group was returning to Norfolk from a six month (and 60,000 mile) deployment. Seeing these big ships come and go right in front of you is always a fun and exciting sight. But seeing these service men and women come home to their families like this always gives me goosebumps. Thanks to all of you for your service. What a great picture!! I’m sure they and their families were so glad to be reunited. As a military wife for so many years, I know how hard it is to be separated from my loved one and how happy the returns were. It must be extra special to live so close to the big ol ships and see this on a semi-regular basis!! We get to see the cargo ships here in Maryland but they only carry a bunch of made in China crap so it’s definitely not the same as seeing a carrier come in to port! How lucky to be at the perfect spot! Imagine how excited they are! Yes,thank you for your service! My brother in law was on that ship 🙂 My sister is very happy to have him back home. That picture is just stunning, always a good thing when our men and women of the military return home.